On episode 29 of TankCast, Arielle and I discussed our Blizzcon predictions. I’m always too conservative when it comes to predictions because Blizzard always surprises me, but I still try. If you wish to hear our conversation on this topic, tune in to episode 29 of TankCast. This post includes what we talked about with a few more specifics added on my part. I predict that the skills we tanks use to stay alive on a short-term basis, like Guard and Savage Defense, are going to be completely redone. The introduction of a new tank class provides an excuse to rework active mitigation, just like version 1 of active mitigation arrived with the Brewmaster. It’s been two expansions since active mitigation was introduced; Blizzard and the community has learned many things about where it worked and where it failed. In particular, I think/hope that there will be offense-defense trade-offs, like we’ve talked about so much on the show. Lots of raiders have been clamoring for it, and if the above revamp is true then this is the best opportunity. However, I don’t think it will be nearly as effective a trade-off as what many are asking. I think that if Blizzard grudgingly implements such a system, they will choose to err on the side of a little dps in trade for a significant amount of survival, similar to the tradeoff between Chi Explosion and Serenity. We know hardly anything about Legion, but Blizzard has repeated quite a bit that class fantasy is of rising importance. As things are currently, each tanking class has something that is a little outside of the fantasy. For instance, assuming the vision of the Brewmaster is still about that soft, agile, coordinated, we will probably see some changes to Guard, especially that bursty playstyle of taking large burst and healing/shielding it quickly that we see today. I also expect to see the removal or reduction of avoidance mitigation, like Elusive Brew and Savage Defense. At their very best, avoidance skills are still random and unpredictable (mostly) and don’t give you a feeling of control and power. At their worst, avoidance skills don’t work against important abilities and the classes that rely on them have to be compensated by being able to simply soak that damage, like Bears with their health. Here’s where I can make totally wild predictions that will be proven hilariously wrong at Blizzcon. I predict that the newest tanking class, the Demon Hunter, will specialize in proactive, simulated avoidance. What I mean by “simulated” is that it’s not in the same vein as today’s avoidance abilities, where you simply increase your chance to dodge or parry, but that they will have abilities that look like a dodge or parry thematically but will mechanically act reliably. I think they might have some abilities like Guardian of Elune, that is a guaranteed dodge, or like Deterrence, which is thematically a really effective parry but mechanically a damage reduction. Demon Hunters are sold as being very agile around the battlefield, so clearly they’ll have lots of movement abilities. They might have thematically movement / mechanically damage reduction abilities, like I mentioned earlier. I predict they will have limited healing abilities, but might be able to leach life with attacks like Illidan in Heroes of the Storm. Illidan also has an Evade ability, that avoids attacks for 2 seconds, and options to increase his tankiness by leaching more, or blocking, or reducing damage. We already know that Metamorphasis will be key to the Demon Hunter rotation, and I predict that for tanks it will be a mini-cooldown similar to Guard. It won’t be something that is always available, but it’s a skill you build up to and unleash more often than once or twice a fight. I expect it to be resource-based rather than cooldown based since it’s so integral to the Demon Hunter identity. We’ve heard rumors that multistrike is gone, which would leave us with only four normal secondaries: crit, haste, versatility, and mastery. Are those enough? I don’t have so many predictions here. Instead I suspect that something will change, and I don’t know what. Secondary stat customization is in a weird place. We’ve lost some stat customization though reforging. The increasing item levels of drops the further you dive into a raid invalidate much of those choices based on secondaries. Sharing tier gear between specs means that you can never have much of an optimized choice, should you value your bonuses. Blizzard has tried to make each secondary stat nominally valuable to each spec, and while they’ve gotten closer they’re still far from success. And with the implied drop from five to four or maybe even three secondaries, is there a reason to keep trying to make stat customization a thing? Maybe Blizzcon will tell. This is easy, but I hope to see some more artifact weapon reveals. As a Brewmaster, I predict that our weapon will be a polearm. We know the mistweaver weapon is a staff, so that’s already taken. And as much as I prefer transmogging dual-wield weapons, a two-hander fits a defensive theme better. That leaves polearm. I hope that we somehow get an invisible polearm and a giant keg weapon sitting on our backs, like Chen Stormstout. A more realistic prediction is Chen’s staff, which we already have easily obtainable ingame, but maybe the artifact will be a fancier version. His staff is a simple bamboo pole with a jug swinging from the end. Druids have a sizable history to draw from, though the most obvious historical druid would be Malfurion. He’s sometimes depicted wielding a staff or claws. There are also many figures of night elf lore who might give inspiration to weapons, like Cenarius, the patron god of druids, and Malorne is the stag god guardian of nature. 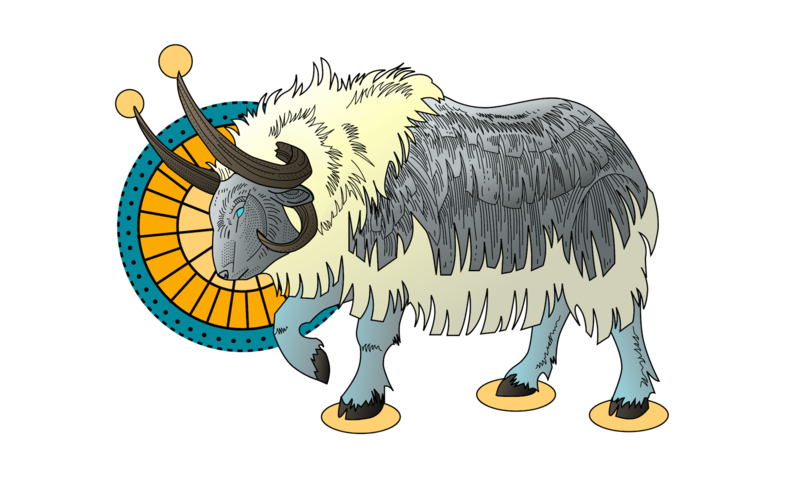 More immediately relevant to bears, there’s Ursoc and Ursol, the bear-like demigods worshiped by furbolgs. One thing we can assume about the bear weapon is that it will give unique bear skins, just like the Fangs of the First Nightsaber for feral druids. Paladins have many famous weapons and historical figures to choose from. We know that Ashbringer is going to be the retribution paladin artifact, but there’s still numerous factions of paladins to draw from for the tank artifact. Protection paladins are all about their hammers, so I’d be surprised if they get anything else, though it would technically be a mace. 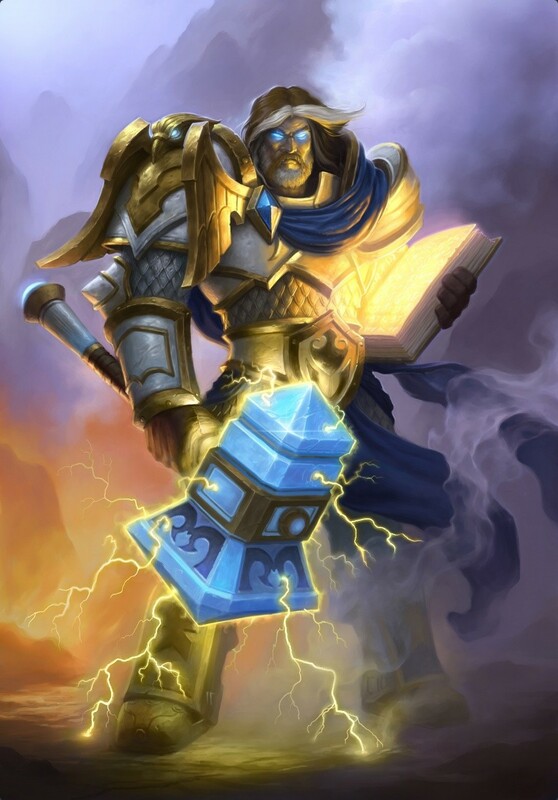 Uther himself wielded a hammer. Death Knights already know what their artifact is: Maw of the Damned. This axe is from a demon who “used this massive axe to steal the life force of his enemies and replenish his own”. While the demon himself is far from famous, that description sure does fit the blood death knight theme. 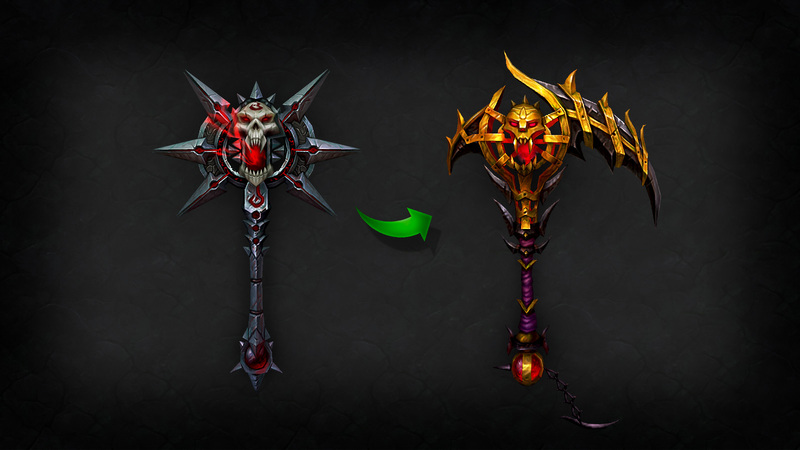 And finally, for Demon Hunters, the most famous glaives are probably needed by their current owner. We have poor quality images of the demon hunter weapons, but no name yet.